This page is designed for those who want to see basics of the furnace and air conditioner installation. Is it time to replace your furnace? Fill out a Repair or Replace Report Card. If you have squealing sounds from furnace, it generally occurs when the belt that connects the motor to the fan slips. If the blower is making a grinding noise, you should shut off the unit and call a furnace repair technician; the motor's bearings are probably shot. In most cases, the belt is improperly aligned or worn and needs replacement. This job involves removing the access panel, loosening a couple of bolts that hold the blower motor at the proper tension, and realigning or adjusting the belt. When reinstalling the belt, be careful not to over-tighten it this can wear out the motor bearings. If the furnace makes rattling noises when it runs, be sure the cover panels are screwed on tight. If they aren't, tighten them. If after a furnace shuts off you can hear a fairly loud buzzing noise it could be taken care of by tightening the mounting of the transformer. If you hear the humming noise, remove the cover to the burner compartment of your furnace. Try listening to hear which control or component is making the noise. If you find something that is humming you can usually get rid of the noise by tightening the mounting screws. If it won’t help you can put a small piece of cardboard or plastic under the item and remount it. If you don't hear anything in the burner compartment, you will need to remove the panel to the blower compartment. When you do this a door switch will open and cut off power to the furnace and stop the noise. Press the switch back down and listen for the noise. If you are able to figure out where it is coming from try tightening the mounting. If you are hearing a loud whining noise on the upper floor above where the furnace is, but when standing beside the furnace it sounds normal. Then you can turn off the furnace and turn on the blower only. Take off the lower panel on the furnace, trip the power switch to run the blower and see if the noise stops. If so, it may be air noise from a leak around the furnace base. When the panel is reinstalled and the blower running, go upstairs and listen to see if the noise gradually subsides as the blower slows down when the blower is turned off. If so, it is an air leak somewhere. If that doesn’t locate the noise turn the blower off, turn on the heat and check the combustion air blower motor inside the top panel for noise. If still have the noise it may be in the plenum on top of the furnace which would have been modified for the new furnace. Is it sealed well? Another check would be the return air grille for air noise, or even something in the return air plenum. You may have an air leak that is projecting the noise up and thru the furnace. Look around carefully for leaks. Nothing inside the furnace should be able to create such a noise. If your furnace making a clicking noise when it is ready to shut down after running a full cycle, the blower shuts off then the clicking starts. With the clicking you can also hear it make the swoosh noise it makes when the burner initially ignites, only it comes in several intervals with the clicking. You can see little bursts of flames when it does this several times in a row then it shuts down completely. Then you may have a clicking gas valve that is leaking gas. First, check the low voltage wiring for loose terminals. Start at the gas valve and work backwards thru the air pressure switch and on to the circuit board. Second, remove the hose from the combustion air motor to the air pressure switch, blow thru it to clean it. Then check the switch for obstructions. Third, start the combustion air motor and check for air blowing out the opening for the hose. Now, reassemble and retest the furnace, if not OK, check the wiring at the thermostat for loose wiring terminals. If your furnace is making a low rumbling noise then you may want to check and see if your motor has oil ports if so you may want to try putting a few drops of oil in them if not you might call a service company and have them check the Amp draw of the blower. If your furnace has started to make a rattle noise about 30 seconds before the blower kicks on. The rattle may sound like a vibrating water pipe. Then you may have a problem with the heat exchanger. It may have developed a crack and as the exchanger heats up, it will make sometimes a sound as described or a loud bang when it expands. It needs to be checked as soon as possible as carbon monoxide could enter the ductwork if there is a crack. If you have a gas furnace with a self igniter you may hear a clicking noise that won't stop. When you turn the gas off and unplug the spark plug wire, there could be a low humming noise that sounds like it's coming from the control module. Then you can check the flame sensor and make sure it’s clean. If it still clicks you may change the sensor. You may experience a random nose from your furnace. Whenever this noise occurs, there is no air blowing from the vent on the floor. This noise last the same duration as when it is working fine. This could be that whenever this noise occurs, the fan in the furnace does not turn. Then first check the blower to see if it was tight and that you couldn't move it to the point where the blower might contact the sides of the housing. At the same time, checks to see that the motor mounting bolts are tight. When the blower runs on your 25 old furnace you may hear a mild moaning or groaning noise, you may have worn motor bearings. Grasping the motor shaft and moving it up and down (perpendicular to the motor) you should not feel any play. Side to side movement is normal. If your furnace has started squealing then the bushings in the motor are "dry" - to go dry they have to be worn out. The bushing material has lube in it. For the bushings to squeal it means the portion of the bushing with the lube in it is worn through. If it is still working you could access the motor and lube the bushings. This is only a temporary fix. Once you have excavated and disassembled all the way to the motor you will just replace it. If your furnace started making a loud, low, steady train like noise every time it comes on. If it is not a higher pitched squeak, but more like an engine and if it’s direct drive blower, meaning that the blower wheel is attached directly to the motor shaft, then the motor bearings are bad. This is the most common reason for noise coming from the blower compartment. About the only remedy to this is to replace the motor. If you hear a weird noise from furnace and it appears that your fan has loosened and is brushing against the housing, then setscrew probably came loose. Turn power off to furnace. Reach hand in blower wheel on left side. Feel around hub. You will find a setscrew. Probably loose. Move blower wheel back to center on housing. Align setscrew with flat spot on shaft. Tighten screw. You should check to make sure that motor shaft is not rounded. If your pilot comes on and the burners ignite the furnace hammers hard. Then you can wiggle all the stake on connections on the circuit board and the plastic connection going to the igniter and pilot assembly. If your air handler sits on the ceiling joists and it is very noisy. Then you can try to put the isolation pads first, cheap easy fix. Check the blower wheel to see if it is off balance due to excess dirt on the blades. May have an off balance wheel from the factory and need a new one. If you are going to stay in the house, I recommend hanging the unit with spring isolators. Do not forget to add a canvas between the unit and the discharge ductwork too. If you are trying to reduce the furnace noise, you can cut down on the sound coming off of it by insulating the furnace room walls with rock wool. Next, look at your furnace. Typically it is the fan motor, or associated moving parts. Sometimes it is the housing vibrating from the spinning of the blower fan. It may be the plenum or metal box that the air blows through to get to the ductwork. First off look at the fan. If the furnace or air conditioner kicks on and there is a rattling or grinding or whining or other noise that accelerates as the fan picks up speed, the bearings in the fan blades or motor are going bad. If the noise is worse when the fan is at full speed and stays constant while the unit is blowing air it could be that the belt is loose or if no belt the linkage from motor to blower fan is loose or worn out. This may be fixable with a little tinkering. Mounting for the motor or fan blower may be loose, try to tighten the screws or bolts that hold them down. If the noise starts slowly after the fan is at full speed it could be that there is resistance in the plenum or ductwork or vents. This usually isn't that noisy, but it can be bad. You should go throughout the house in each room and make sure that the ducts are clear and vents are all open to the full. Usually there are fins that direct the flow to a certain direction these should be open wide, also behind them may be a flow restrictor fins. These are used typically with a lever that opens or close the flow off completely to 'zone control' the room. These should be open wide as can be too for the testing. Also, should be the air ducts and vents in each room are open wide and blowing air full when the unit is operating. If any air vents are open wide and don't blow air with good force - should be similar from vent to vent and from room to room, decreasing slightly the farther from the furnace unit you get - then the ducts are blocked somehow. If they are in the attic, they may have been crushed. Or maybe you have squirrels building nests within them or something. If they are smashed, reshape as best you can and see if that gets the air going again. Be careful not to tear them open or cause leaks in the duct itself. If too much air is restricted from coming through the ducts it can make the unit noisier. If the ducts leak into the attic or basement you lose heat/cool into that space instead of the room and could cause water damage from condensation. Seal leaks with duct tape or replace the duct. Same goes for the returns; usually there is one at the furnace unit on the door to the unit or an adjacent wall. The filter usually goes there. The filter should be clean and fit properly for the opening so all air goes through it not around the edges. Other return air ducts can be placed throughout the house in larger homes so check that the same as the air ducts and clear any blockages. Sometime when the new unit is installed, the unit is too powerful for the size of ductwork existing and this can backpressure the unit causing excessive noise and resultant loss of efficiency of the entire unit. It is working too hard to force air through it. This is hard to calculate, a bigger plenum and more ductwork is required. Other major noise may be the plenum, duct work, vents or surrounding wallboard or the floor where the unit sits may be loose and making vibration noise that can be dampened by securing it properly. 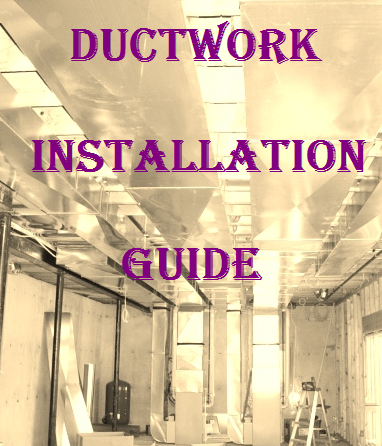 If it is rattling or humming it may be the plenum or duct work. Tap on the plenum and ducts to see how loose they are and if so, try to screw rivet or tape the parts that are noisy so they can't flex so much. This may dampen the sound a bit. Make sure that the floor under the unit is solid and doesn't have any weakness at all. Sometimes there is water damage from condensation or poorly braced for the weight of the unit or other reasons that weakens the joists or flooring and that can really make it noisy but not be obvious. Unfortunately, this may be an expensive or extensive job to fix but maybe worth the trouble if the floor is damaged enough to break under the unit. Another more extensive fix can be to double up the drywall board around where the furnace is to quiet it down. This seems radical, but it will reduce a noisy unit significantly if done properly. In short, eliminate any vibration noise, air flow restriction noise, or structural weakening, use sound barriers in the rooms or consider replacing the furnace altogether. If your furnace makes a very loud howling noise when it kicks on, then you may energize the fan only first to determine if the noise possibly comes from the duct work. Also it could be a heat exchanger issue. You can take one of those long lighters, and insert it in each of the burner ports. If the flame "wanders", while the fan is energized, then it is likely you have a crack in the heat exchanger. If your oil furnace starts with a “Womp”, then as it burns, is sounds like it sputtering like--putt, putt, putt, putt,-until the heater shuts off, then this can be very dangerous! The burner is not setup properly. You are getting delayed ignition and it sounds like the fuel to air mixture is wrong. Get it checked ASAP and yes the pulsating can and may have damaged the combustion chamber. If your furnace has started making a very loud hum/roar noise and it could be extremely loud when in second stage. You may narrow it down to the inducer motor. When you put pressure on the housing, the vibrating noise/roar goes away. Then you need a new motor and wheel and the wheel is very easy to bend/warp when installing so you should be gentle with it. If you notice a high pitched whine coming from the furnace, your house has 2 zones, and it only noticeable when zone 2 (the 2nd floor) of the house is heated and when the blower kicks up to its highest speed. Then most likely it is going to be a velocity issue in a duct. The best way you can describe it is that it sounds like when you run your finger around the top of a whine glass, or when you strike and hold a tuning fork. The way you can fix it is take out blower and use a tape to keep the metal housing of the blower from actually coming in contact with its track on the air handler. The others way by fixing static pressure problems that allowed the motor to ramp down and run at different rpm. Also, you need to add more ductwork to the second floor or add a by-pass damper. Or you possibly could "dump" some air somewhere. You can put in a "wild" zone on. The ECM motor will ramp up - more airflow, if there is restriction to the airflow. This, of course, results in air noise and/or vibrations somewhere. If your air-handler started to sound like a diesel truck in idle, your unit swaying in its straps and vibrating like crazy. You may pull off the access panel and as the blower came to a stop you may heard a distinct whooshing sound. Once it stopped you may see a piece of paper sucked into the blower. It’s amazing how a piece of paper can completely throw the balance off. If you have electric furnace in your home, it may start making this loud humming noise after it's been on for five or ten minutes. The problem of this furnace is heat related. The furnace expands when heated and something is "loosening". Also it could be in the ductwork. If it works properly, you should not worry too much about it. Also it could be the transformer making the noise. You can spray it with Beauty Tone clear lacquer and make it nice and quiet. If your furnace starts and runs fine but has an incessant buzzing at small solenoid winding at gas valve. You can trace it to this component with a mechanic's stethoscope. Then you can replace it. If your gas furnace makes a roaring sound, a lot of times this is caused by a dirty burner. The burner doesn’t light correctly, and when it does light, the flame travels all the way back to the burner orifice where the gas is suppose to mix with air before being burned. This creates sort of a torch sound. This is not normal and not really a safe situation. 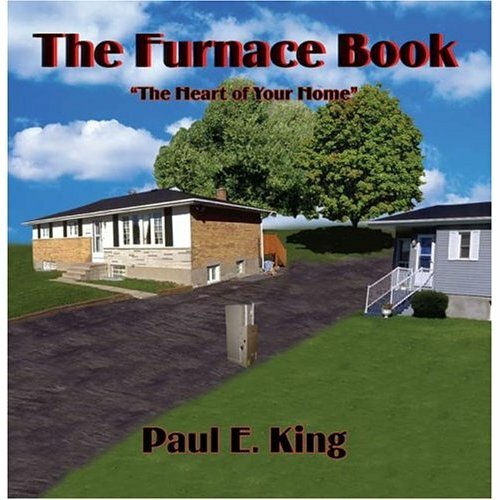 You should have the furnace cleaned and tuned up by a professional as soon as possible. If you replaced the filter in your furnace and there is a high pitched whistling noise coming from the unit whenever the furnace is on. It could be part of the frame not fitting together correctly, just feel around and push one area of the frame, it may quit whistling immediately. Look for sides that have no screws or less than the other side. If you are having problems with your oil furnace that would shut down and you have to hit reset to get it to come back on. It's could be related to starvation of oil flow to the furnace when your oil-fired hot water heater kicks on. At this point the furnace may make a sputtering noise when the hot water heater is on. In order to fix this problem you should run a separate line from the tank to each burner complete with separate shut offs and filters. Oil lines use flare fittings and never solder oil lines. All copper tubing is ACR, so it's all the same wall thickness. Next time you get an oil delivery, shut your burners off for an hour or so. It gives all the sediment in the tank that just was stirred up time to settle. Make sure your oil tank is pitched the opposite way of where the outlet is. That makes the sediment settle where it does less harm. If your oil furnace makes high pitched whining noise when it starts up each time, lasting for approx 1 minute, then it's usually a sign that the bearings are about to go out in the draft inducer motor. Then they get really loud for a while before locking up completely. At that point, the furnace will fail to ignite because the bad motor will send a lockout signal to the IC board. If your Heil furnace developed a loud, high pitched whine when starting and this noise continues for some time. After a while it quits, and when the furnace cycles on during the day it is quiet, then you may change the air filter. If your oil furnace makes a loud explosion noise when it comes on, then your furnace needs a service. It has a clogged nozzle or a weak transformer or the electrodes need dressing up and resetting. 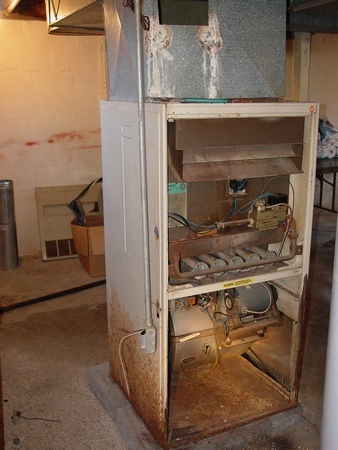 Oil furnaces should be serviced annually. If your furnace makes a chirping sound, that is coming from the blower, then it could be a bracket holding the fan/motor was loose and causing the problem. If your variable speed furnace makes a constant noticeable humming noise when off, then it could be a transformer. Sometimes just a little adjustment of the transformers footing(s) will correct the problem. While doing that you can use foam tape under the transformer's footing and reduced noise quit a bit. Also you can look for the foreign objects stuck to the cover to the transformer.